This was the first to be launched down the slipway on this shed. The boat was built by Thames Ironworks and was a Watson class, non-self-righting boat measuring 43 feet by 12 feet 6 inches at a cost of £1,759. A new shed with a roller slipway had to be constructed at a cost of £2,975-1-9d. The new boat arrived in March 1906 though it was 1912 before her first service call, to the Imuiden trawler Dubbleman though no effective service was carried out. 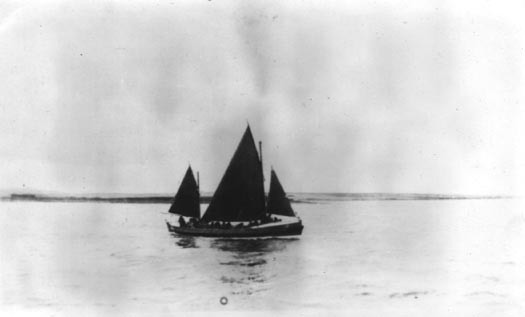 Her first effective service was carried out in October 1916 when she was called to the aid of the Marstal schooner Fulton which had been having difficulties in heavy seas during a northerly gale in the Pentland Firth. On reaching the vessel they found that she was in tow by a Patrol boat. The Lifeboat escorted both vessels to safety. On of her most noted service was to the Helsingsborg steamer SS Citos on the 12th September 1923, the boat was lying on her side on the west side of Stroma. A destroyer was standing by and had rescued 9 of 15 crew who had taken to the ships boats, 6 were lost in the heavy seas. The Anne Miles then rescued the remaining 8 crew from the ship and landing them at Holm (St Marys Village) before returning to the station at Brims. Her last service was to a call from the Hamburg registered SS Curslack. On arrival at the scene she was not required and returned to her home station. Although she does not have many lives saved to her credit she will be a legend told by Longhope folk as long as men tell yarns of the Pentland Firth. She was a superb seaboat and very fast, two trawler skippers were to tell of her doing between 15 and 17 knots going to the aid of the "Citos" in a westerly gale on Sept. 12th. 1923. Note : See also the rescue of the "S.S.Dinnington"